A week ago I took advantage of the wonderful pre-Christmas winter weather to spend a few days in the Coulin hills between Glen Carron and Glen Torridon. I camped on a high col with spacious views and a sense of wildness and remoteness, a magnificent camp site. Many days of hard frost had left the ground hard and icy, though I was able to find a trickle of running water to fill my bottles. Dry weather meant I was able to leave the door of my shelter wide open and fall asleep lying in the entrance gazing at the stars and the almost-full moon. I don’t think I’ve ever had such a glorious and spectacular camp in December before. From my camp I had an exciting day on the hills, the going quite tricky due to ice covering paths, rocks and grass. Before the freeze the weather was very wet and the hills sodden, with a thaw of an earlier snowfall adding to the rain. The sudden coming of the frost had meant huge bubbles of ice rippling across the grass and running down crags where streams had burst their banks. Elsewhere a thin veneer of ice made rocks treacherous while long sections of paths were frozen into skating rinks. Only on the gravel and stone summits where there was no water to freeze was the walking easy. The sky was cloudless and the sun bright, though with little heat and always low down, making for dramatic side lighting even at midday. The air was sharp and cold and as clear as I can ever remember, with more detail in distant hills than I believed possible in our usually hazy air. The glens and straths were full of cloud however, a white canopy hiding roads and houses. Below my camp Coire Lair was full of cloud, which poured very slowly over the lip of the corrie and down into Glen Carron, like a waterfall in slow motion. From Sgorr Ruadh I watched the sun set and a dark red line spread out across the western horizon with the jagged silhouette of the Cuillin Hills on the Isle of Skye breaking into it. The next day I walked back down the icy corrie as the wind picked up and clouds spread across the sky, reaching the road just as the first raindrops fell. The photo of my camp was taken late in the evening in a temperature of -5ºC. Photo info: Canon EOS 350D, Tamron 11-18mm lens at 11mm, f4.5@8 seconds, ISO 1600, tripod, raw file converted to JPEG and processed in DxO Optics Pro. Great shot! I had a great day around the Arrochar Alps on Dec 19th, with conditions very similar to the ones you describe, icy paths, fabulous lights and cloud inversion. Walter, glad you like the picture. The Akto is my favourite tent overall but I do like a roomier shelter for long winter nights. Also, I always have new tents to test. The tent in the picture is a GoLite Shangri-La 3, which is the new version of the old Hex 3. It's very light yet has masses of space. Happy New Year, first of all, and many happy days on the hills in 2008! I had heard about the GoLite Shrangi-La and I thought it could be the one in the picture. I was thinking of getting one myself for ultralight summer use (I use a Nammatj in winter: as you say, the Akto is a bit crammed when you've got heavy winter gear around). I'd be quite interested to hear your comments on the Shrangi-La once you've put it through its paces. It looks quite an interesting tent, although I'm not clear what the overall weight of fly + bug net + floor is like. The tent in the picture is the Shangri-La 3, which is basically a slightly smaller version of the Hex 3. It's designed for 3 people, though I think that would be a squeeze, and is very stable. I use it solo in winter for the room. With pole and pegs it weighs 1.382kg. I don't have the mesh inner. According to the GoLite website this weighs 1.05kg. I don't have the separate floor either - GoLite gives the weight as 620 grams. It fits the whole of the inner tent. I use a light silicone nylon groundsheet weighing 200 grams that fills half the floor area, leaving the other half for cooking and storing damp gear. For summer it could be worth looking at the smaller Shangri-La 1 and 2 shelters. These are basically ridge tent flysheets that erect with trekking poles. The 1 weighs 600 grams with pegs, the 2 830 grams (GoLite figures). The mesh inners weigh 960 grams and 600 grams respectively, the floors 570 grams and 280 grams. I have a Shangri-La 1 on test (but not the inner) and will report on this later in the year. Great Photo ! Was it done on a self timer, or did you have company? Nick, thanks for your comment. It was done with a self-timer, as I was alone. I've learnt to move fast over the years! 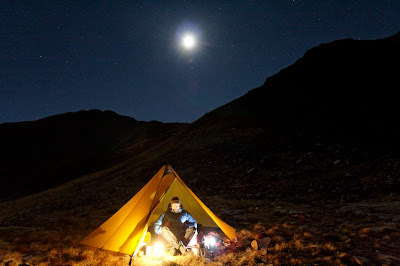 Great shot Chris, when I need to remind myself what its like to be out in the hills on my own at night I often look for pics like that on the web or go and search for the wild camping articles in old TGO magazines. How much will the RRP be on the new shelter? Glad you like the picture Jamie. The Shangri-La 3 is £175. There'll be a review in the April TGO. Nice post Chris. Nothing better than being in a wild place with great weather....34 degree C here today....not much snow and ice around!